Deep in the catacombs under the Vatican in Italy there exists a lot of secret things, including a vast library filled with some of the most ancient books and written documents in the world. The Vatican library was recently re-opened to religious scholars following an extensive $7.5 euro three-year renovation designed to shore up "dangerous structural weaknesses" discovered in the foundation of the Sixteenth Century building. New climate controlled equipment to protect that ancient manuscripts and a new state-of-the-art security system also were installed. It was during the renovation work that workmen, digging deep in the rock under the library, allegedly came upon a long-forgotten grave-site which, if the story is true, obviously shocked the Pope and all of the robed high priests surrounding him. The bones and skulls were reportedly humanoid, but clearly non-human in origin. A story by J. P. Skipper said "it is reported that many skulls have been found that look an awful lot like alien Grays." Since the finding, and a crude video was made that found its way into YouTube, Skipper said "a lid of silence was imposed on this." Skipper speculates that if the reported discovery is true, the alien skulls were discovered in an area of the Vatican that hasn’t been visited for hundreds of years. He suggests that the aliens who made contact were seized by soldiers who turned them over to the church where they were considered an abomination and put to death. The existence of such skulls and bone fragments may have been completely unknown to the Pope and his hierarchy at the time of their discovery. Such a discovery may have had a lot to do with a socking announcement by the Rev. Jose Gabriel Funes, the Jesuit director of the Vatican Observatory, while the construction work was going on. He said that alien life may exist but it does not contradict a faith in God. He also said that the vastness of the universe means it is possible that other forms of life, even intelligent ones, may exist on other worlds. "How can we rule out that life may have developed elsewhere?" Fumes said. "Just as we consider earthly creatures as ‘a brother’ and ‘sister,’ why should we not talk about an ‘extraterrestrial brother?’ It would still be part of creation." This kind of proclamation is not exactly new to the Vatican. But when it happened in earlier times, great scientists like Galileo, who determined that the Earth circled the Sun and not the other way around, as the church proclaimed, suffered. Galileo was tried as a heretic and forced to recant his theory. Giordano Bruno, an Italian Dominican friar, philosopher, mathematician and astronomer, who lived from 1548 to 1600, was put to death for heresy because of his books in which he theorized that the Sun was a star and that the universe contained an infinite number of inhabited worlds populated by other intelligent beings. He went beyond Copernicus in establishing arguments that the Earth revolved around the Sun and that the apparent diurnal rotation of the heavens is but an illusion caused by the rotation of the Earth on its axis. 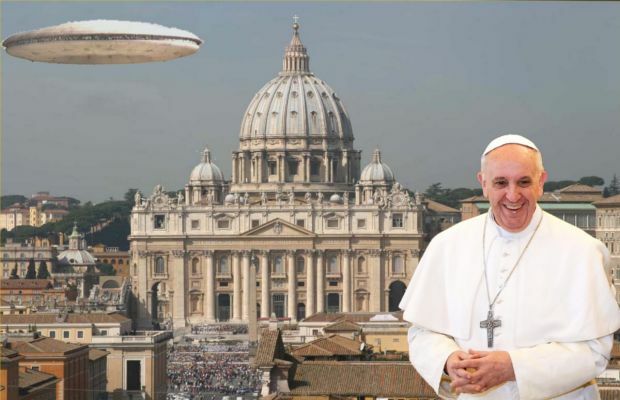 Because of its long dark history of narrow-minded beliefs, the admission by a representative of the Vatican that aliens may exist was pretty radical. If the Rev. Funes is not burned at the stake for what he said, it means that something very important has happened. And it may involve the discovery of some interesting old bones under the library.